Can these girls BE any cuter?? And their space is to DIE for!! What is your aesthetic? 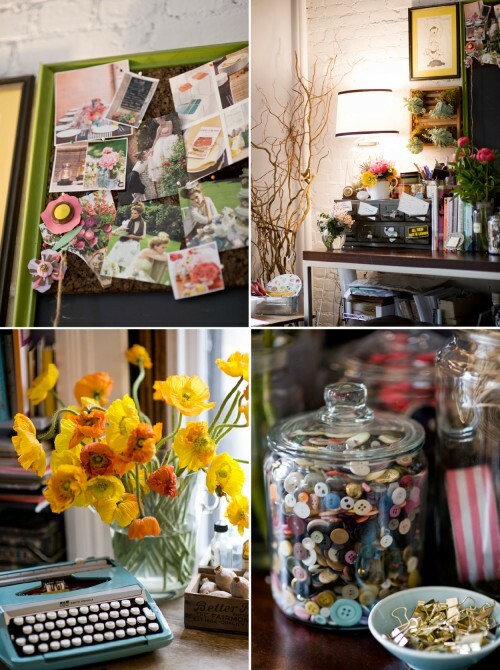 I’d say our aesthetic is country garden meets fabulous vintage shop. We love bold, bright flowers and found objects, and what happens when you put the two together! How does your studio style convey your professional aesthetic? We’re surrounded by vintage vases, antiques, and found objects that we use in many of our designs and they certainly keep us inspired! Also, the more permanent parts of our studio, like our old farmhouse table (now desk) and old industrial toolbox, reflect our belief that beauty can be found and realized in unexpected places. Favorite part of your studio? The big shuttered windows let lots of light pour into the space which makes for a pretty great place to work! Where do you go for inspiration? Our antiquing trips outside of the city really inspire us. It’s really fun to find little treasures and use them in our designs. We recently found a vintage hat box that said “park ave nyc” on it. We bought it and filled it with flowers for an event. Also, any place with fresh flowers and produce. We’ve definitely been known to go to the farmers market and come back with huge amounts of herbs and vegetables… excited to turn them into some fabulous centerpiece or bouquet. Is there anything you’d upgrade to? Sometimes we daydream about our future retail shop. We’ve already designed the whole space in our heads. Anything else we should know? 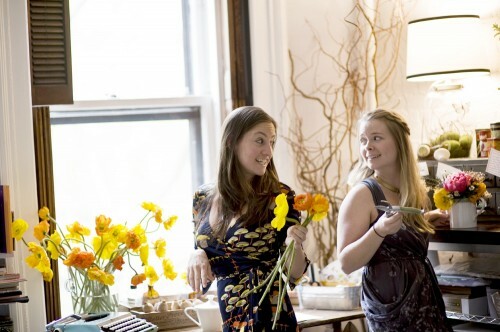 We really love when we get the chance to work on the overall design of a wedding. It is so exciting to help our clients take their personal sense of style and turn it into an environment that reflects them as a couple. We also love getting to handcraft all of the tiny details… we’re mad for the crafty stuff! Thanks for sharing! 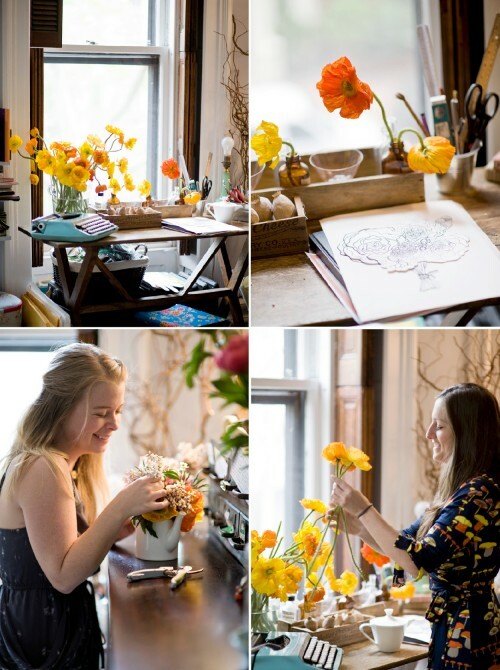 So glad there are other florist providers around the world with vintage, eclectic, chic charm, rather than traditional florists – beautiful work girls! So MUCH light and room in their workspace (or photo must be deceiving). Looks like the orange and yellow colored flowers include a mix of ranunculus and poppies. Am I right?